Included here is information to Florida train rides as well as a brief history of the state's railroad. The very first can be traced back to the 1830's although modern railroading did not reach its borders until Henry Flagler's arrival. During this time a number of 3-foot, "narrow-gauge" operations sprang up, as Dr. George Hilton notes in this book, "American Narrow Gauge Railroads." None, however, were particularly successful. In the 1890's that all changed when Flagler's Florida East Coast Railway transformed what had been an unbearably hot and humid place, filled with mosquitoes and other dangerous critters, into a successful vacation destination. While rail mileage has dropped by nearly half since its all-time high, trains still play an important role in the Sunshined State, including along the fabled FEC. If you're interested in a leisurely train ride there several to choose from; the most notable include the Seminole Gulf Railway and Orlando & North Western Railway. What's more, thanks to the region's sub-tropical climate these attractions are open nearly year-round. In any event, more information about Florida train rides can be found below. Please note! This guide information pertains only to vacation/tourism destinations. Florida's very first railroad was the mule-powered Tallahassee Railroad, opened in 1837. This 22-mile, five-foot gauge operation connected Tallahassee with the port of St. Marks on the Gulf of Mexico. In the succeeding five decades what were largely three-foot operations were haphazardly constructed across the state. Used primarily for the purpose of extracting natural resources, they carried few people on a peninsula virtually devoid of human population. The swampy land, brutal tropical heat, mosquitoes, poisonous animals, disease (like malaria), and alligators made it an extremely inhospitable place. Efforts to transform Florida into the popular destination for which it is now known began with mogul Henry M. Flagler. Virtually all of the state's eastern coast line lay empty south of St. Augustine and remained this way into the early 20th century. As his FEC was gradually extended southward, reaching the then-small hamlet of Miami on April 15, 1896, he built numerous resorts to increase ridership along his railroad. The tactic worked as evermore folks flocked to the coast. In 1926 the FEC handled an incredible 1 billion ton-miles in business, garnering total revenues of $29.4 million, an increase of more than $13 million in only three years! The FEC frantically attempted to keep pace by double-tracking its entire main line between Jacksonville and Miami (completed in 1926) and opened the Moultrie Cutoff between St. Augustine and Bunnell. For a complete history of the Florida Coast Railway please click here. 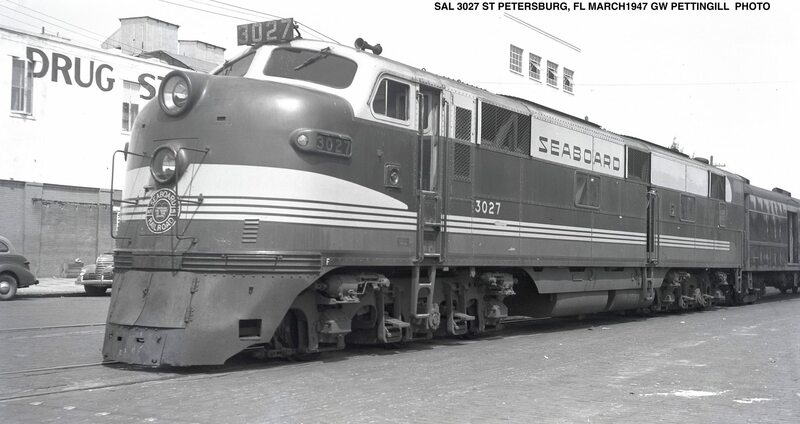 In time, several other noteworthy railroads would come to serve Florida including the Southern Railway, Louisville & Nashville, St. Louis-San Francisco Railway, Atlantic Coast Line, and Seaboard Air Line. The latter two companies enjoyed the greatest coverage, situated down the peninsula from the state's center towards the Gulf Coast. The Seaboard also penetrated Miami and was FEC's only competitor in this part of the state. The SAL and ACL dispatched a number of successful streamliners there, which remained popular well into the 1960's. As railroads fell out of favor, trackage was slowly abandoned. According to the book, "The Routledge Historical Atlas Of The American Railroads" by author John F. Stover, mileage peaked in the 1920's at more than 5,200. Today, however, this number has been reduced to just 2,818 according to the Association of American Railroads. The state's tourist railroads and museums attempt to keep alive its rich heritage by blending entertainment with history. The Boca Express Train Museum, operated by the Boca Raton Historical Society, is based in Boca Raton, Florida within the town's former Florida East Coast depot, a stucco facility originally completed in 1929 and designed by architect Chester G. Henninger. It also features an addition finished in 1957. On the grounds is a small collection of equipment as well as indoor displays. Their most interesting pieces include a dining and lounge car built by the Budd Company for the Seaboard Air Line in 1947 as well as an Atlantic Coast Line caboose. Finally, a preserved steam locomotive is also on display; 0-6-0T #69 manufactured for Duquesne Slag Products by the Baldwin Locomotive Works in 1930 (now listed as #12). The historical society does require admission; please visit their website for opening hours and pricing. Located in Winter Garden and operated by the Central Florida Railway Historical Society this museum is housed inside the restored 1913 stucco depot originally built for the Tavares & Gulf Railroad, which became a future component of Seaboard Air Line. The museum officially opened during a grand ceremony held on May 21, 1983 following the society's purchase of the building on October 22, 1979 from, what was then, the Seaboard Coast Line. The group states their primary mission "...is committed to the collection and preservation of railroad history, with a special focus on Central Florida, and the restoration and exhibition of railroad memorabilia for the education and enjoyment of present and future generations." Learn more about the local rail history as well as peruse a few displays on hand. The museum states it is open throughout much of the year, except on select holidays, from 1 PM to 5 PM. The Flagler Museum, based in Palm Beach, is situated within Henry M. Flagler's gorgeous estates in Palm Beach known as "Whitehall." It was completed in 1902. The organization states their primary mission is to tell the history of Florida's development thanks to the efforts of Henry Flagler. His Florida East Coast Railway is often not recognized for the very important role it played in Florida's development into the tourism mecca for which it is known today. 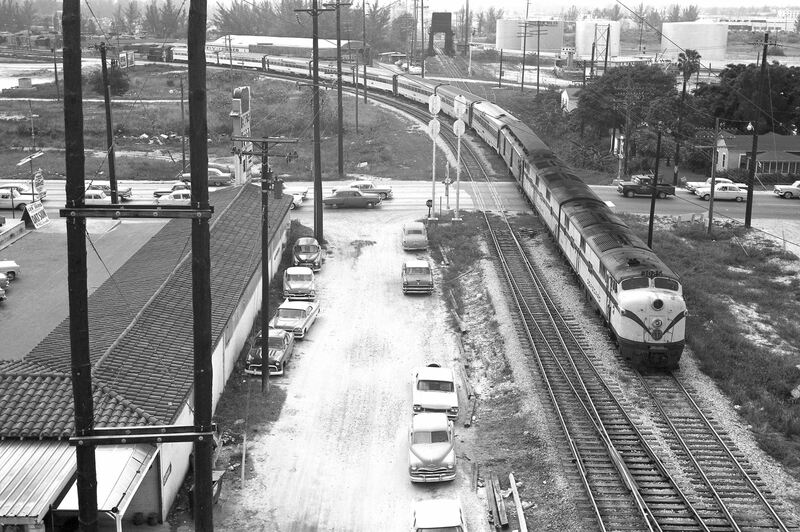 This railroad single-handedly established popular vacation spots like New Smyrna Beach, West Palm Beach, Fort Lauderdale, and Miami. These cities would never have grown into the popular, worldwide attractions for which they are now known if it were not for Flagler and the FEC. The museum is open throughout the year except on major holidays. Or, if you become a member you can visit at no charge. The beginnings of the Florida Railroad Museum (FRRM: reporting mark, FGCX) actually predate the museum itself. Its earliest heritage dates back to 1981 and it was officially recognized as an official state railroad museum in 1984 (also known as the Florida Gulf Coast Railroad Museum). Located in Parrish (just outside of St. Petersburg) it not only highlights railroading in general but also presents Florida’s rail history in particular. Along with several featured pieces of rolling stock and locomotives the museum has several other activities available to enjoy, such as excursion rides. Part of their property includes a nearly 7-mile stretch of former Seaboard Air Line trackage; operating between Parrish and Willow the train (using one of three operational locomotives including an RS3, GP7, or 44-ton switcher) includes your choice of an open-air or air-conditioned car. The museum also offers caboose rentals for birthdays as well as cab rides and discounts for large groups. The Gold Coast Railroad Museum, based in Miami along 152nd Street has been open to the public since 1956, located on the grounds of what was formerly known as Naval Air Station Richmond. The facility contains 3 miles of trackage and a large warehouse to store their collection, which has grown quite impressively over the years. It now contains a number of steam and diesel locomotives along with several passenger/freight cars. Its steam roster currently includes Winston Company 0-4-0 #48 (a narrow-gauge design built by Alco's Cooke Works in 1922), Florida East Coast 4-6-2 #153 (manufactured by Alco in 1922), and Florida East Coast 4-6-2 #113 (built by Alco in 1913). In addition, the group offers train and cab riders over a short stretch of trackage, which includes playing host to popular "A Day Out With Thomas" and "The Polar Express" events. The Largo Central, based in Largo, maintains a 1.2-mile miniature railroad which runs through the Largo Central Park, operated by the LCRR Club. Whether you are interested in actually riding their trains or merely watching from afar they have established an impressive fleet of equipment, from all-matching consists to "freight" trains pulled by steam locomotives. They have become such a popular attraction that the group now asks visitors to be in line for a trip at least 15 minutes before closing time (10 AM - 4 PM). Since the club is an all-volunteer organization the railroad is open only during the first weekend of each month. To learn more about their operation and riding the trains please visit their website or stop by their Facebook page where you can see several photos and videos of their little operation. It is quite impressive! The Orlando & North Western was inaugurated in 2017 when it took over excursion service for what was previously known as the Tavares, Eustis & Gulf (which proclaimed itself as the "Orange Blossom Cannonball"). When the latter organization was forced to shutdown following a dispute with the Florida Central Railroad, owner of the trackage, it also ended trips powered by what was the only standard-gauge steam locomotive operating in Florida, 2-6-0 #2 built by the Baldwin Locomotive Works in 1907. However, the O&NW, otherwise known as "The Royal Palm Railway Experience," has really transformed this excursion experience into a first-class operation with well-maintained equipment, historic diesel locomotives wearing either attractive or historic paint schemes, and numerous special events (including for the holidays) throughout the year. To learn more about this attraction please visit their website. If you interested in Florida train rides with meals served aboard the Star Clipper Dinner Train offer just such an experience. This train was once located in Michigan but with a new owner it has been moved to the warmer climate of Florida (Eustis). Running throughout much of the year it features a wide range of dining options; other perks include themed trains, murder mystery specials, and charters. These trips depart the depot in Eustis and travel past Lake Eustis, Lake Francis and Lake Dora before returning Eustis. The entire excursions lasts about 2 hours. This often forgotten facility is located in Fort Myers, featuring a small collection of equipment and interpretive displays. Their more noteworthy pieces include Atlantic Coast Line 0-6-0 #143 (manufactured by the Baldwin Locomotive Works in 1905) and a caboose built for the Seaboard Air Line in 1953. In addition, be sure and catch a train ride on their miniature, 1/8th-scale railroad. It operates roughly 1-mile through "a fully operational grade crossing, a 100’ tunnel (with lights and sound), by a waterfall, past a windmill, over a twenty-foot trestle, and a twenty-foot pedestrian bridge. Along the way, the train passes numerous scale sized buildings that make up the villages along the route, many providing historical perspective in depicting local Southwest Florida communities as they were circa 1950." The museum is open throughout much of the year and has a gift shop available. Perhaps the most interesting of Florida train rides is the Seminole Gulf Railway, located in Fort Myers. While it is an operating freight railroad the company also hosts popular excursions, which have been running since the early 1990's. Today, you have your choice of a standard excursion during the day or the very popular Murder Mystery Train that includes a fine dinner and show. The Seminole Gulf’s trips also offer a beautiful look at southwest Florida by rail as trains travel north out of Fort Myers. If you are after a relaxing alternative to the nearby hustle and bustle, whether you’re a vacationer or simply a local resident, a trip aboard the Seminole Gulf is most definitely a memorable experience. The trains are powered by streamlined "F" units, whose heritage date back to the Baltimore & Ohio Railroad and Chicago, Milwaukee, St. Paul & Pacific (The Milwaukee Road). The Seminole Gulf runs a total of four cars on its excursion trains whose names include the Sanibel, Marco, Gasparilla and Captiva. The TECO provides trolley rides through the downtown area of Tampa on more than 2 miles of streetcar trackage. They use restored Birney cars and have plans to expand the system. To learn more about riding this restored operation (the city once had trolleys years ago) please visit their website. For those who know the life and background of Walt Disney, the man had a great love for railroads and based his original tourist attraction on the concept that it would be served by a railroad to transport folks from one part of the park to another. Since this attraction is located when the world-renowned Walt Disney World at the Magic Kingdom it is without question Florida's most popular railroad attraction due to park's shear number of visitors. The 3-foot, narrow-gauge railroad is 1.5 miles in length and connects the entire facility as originally envisioned by Walt Disney himself. The railroad utilizes original, restored steam locomotives and has long been one of Disney World's main attractions. For those interested in the locomotives' heritage they were originally built for the Ferrocarriles Unidos de Yucatán, a 3-foot system which operated in the Mexican state of Yucatán. They include 2-6-0 #2 (built by Baldwin in 1928 and named Lilly Belle), 4-4-0 #4 (built by Baldwin in 1916 and named R.O. Disney), 4-6-0 #3 (built by Baldwin in 1925 and named Roger E. Broggie), and 4-6-0 #1 (built by Baldwin in 1925 and named W.E. Disney). All four are fully operational.